The 411 on Xaviars at Piermont. Experience: Doral Arrowwood in Purchase, N.Y., Farm Neck Golf Club in Martha’s Vineyard; Harvest Bistro in Closter, N.J.; Relish in Sparkill; Bedford Post Inn in Bedford; X20 in Yonkers. 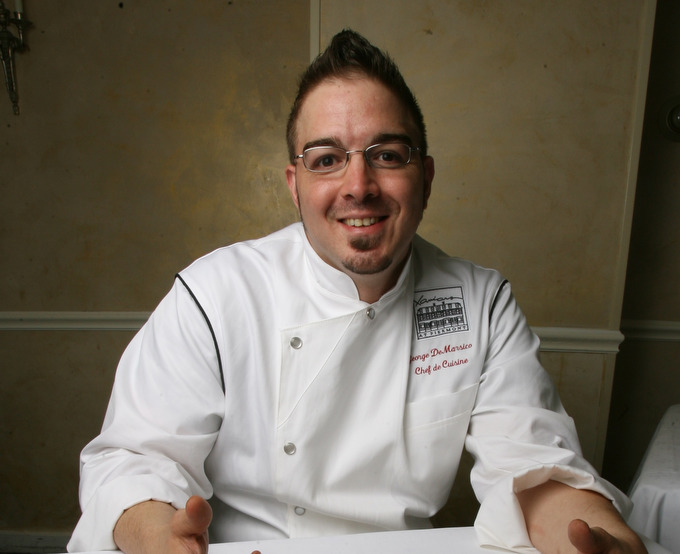 Why we chose him: DeMarisco first made a name for himself at the now-closed Relish in Sparkill, where his beautifully plated, innovative dishes belied the simple, schoolhouse setting of the restaurant. His love for local ingredients has made its way onto Xaviars’ Sunday menu, which features a farmers market dinner. In October, for example, he served a steamed Long Island black bass with local Swiss chard gratin and ginger-beet coulis, a colorful combination of sweet and tart. Karen Croke contributed. Photo by Peter Carr/TJN. I am a few years older but you may remember the Restaurant in Bardonia called “Lock Stock and Barrel own and operated by two brother Joel and Jesse Epstein ? Well that’s where I got part of my early start back in 1985. Well anyway dude I hope to hear back from you and congrats on Xaviers it’s still one the tops in county. My name is Jayme and your lovely wife is my parents real estate agent. I have been cooking my whole life and about a year ago entered the culinary world professionally. Food is truly my passion. I love how something so simple can be turned into the most beautiful piece of art and be a never forgotten meal. I am currently working in an Italian restaurant. I have to say I am very hard on myself and you and your talent makes me push harder. I would love for you to train me and have me work with you. Please do respond as I am eager to work with you and make magic just like you.